A news item reported by the BBC on 2 April revealed a decline in the number of international students coming into the United Kingdom for the first time in 29 years. This is actually old news as in a blog published by Universities UK a couple of weeks ago, Dan Hurley examined both UK HESA data on international student enrolments and the latest UK student visa statistics. We were intrigued by his analysis which suggested, unsurprisingly, that while the drop in international enrolments to the UK for higher education was hardly a nose-dive (except for India), when one compared to other English speaking destination countries, there are some worrying signs. – Canada – most recent data is 2012/13 – also reports significant international enrolment increases – especially from India and China. On a more promising note, the most recent Office of National Statistics figures suggest a 7% increase in student visa applications for Higher Education programmes, but a continuing decline for Further Education visa applications – a sector which appears to have been decimated by the changes to student immigration rules in the United Kingdom. It got us wondering what factors might be behind the ebb and flow of student migration. Looking at destination countries from the perspective of the two largest sending nations reveals some interesting patterns. The most recent international data on Chinese and Indian student enrolments in higher education at source countries reveals close parallels. China taking off – in the UK and United States and India on the decline – with evidence of a slight rebound in Australia in December 2013. India declines (and in fact at an alarming level in the UK). What is puzzling is that if this were merely a visa issue – then one might expect to see closer parallels between all visa national countries for the markets examined. Clearly there are other factors at work. Cost for one. Over the past ten years, the annual cost of studying for a degree in Australia has risen by 69% (from A$30260 in 2003-04 to $A51160 in 2013). At a 5% annual growth, these price rises are in excess of inflation. However, consider the Indian student for whom the cost of a year in an Australian university has risen by more than three times that rate. Conversely, the strength of the Chinese yuan against major western currencies over the past ten years has cushioned the Chinese consumer from the price increases. 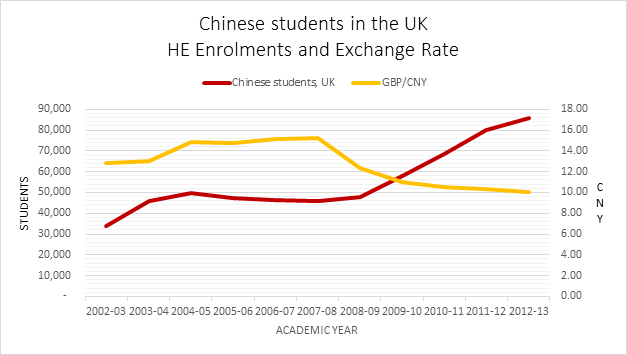 So, while the cost of a year in a UK university has risen by 60% over the past ten years, for Chinese students the figure has only increased by 17%. Perhaps it is no surprise to see that within a year of the Chinese yuan’s climb against UK sterling, the number of students coming to the UK began to soar. Although the exercise has undoubtedly been conducted elsewhere, there does appear to be a link between exchange rate and the volume of students in a given host destination. Unsurprisingly, there is a delayed impact. Focusing on the two largest source markets, China and India, one can identify the very rapid increase in student enrolments following closely an appreciating of the source country’s currency against the destination market. Nowhere is this more evident that China. But it is not a straightforward correlation. There are other factors influencing decisions. 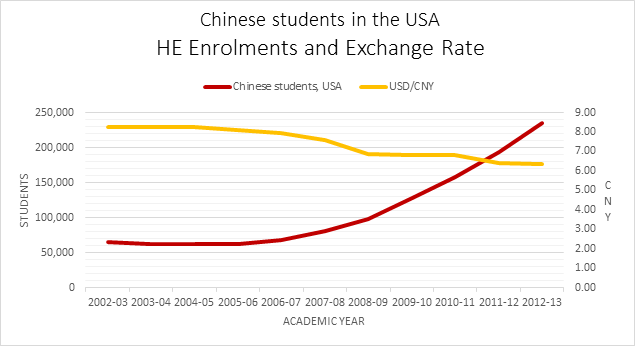 The real acceleration in Chinese students enrolling in US universities began in 2006/07 – and this in turn has coincided with a rapid appreciation of the Chinese yuan against the US dollar. One can detect an even more dramatic impact in the United Kingdom. The rapid appreciation of the Chinese currency against Sterling began in 2007/08. One year later, Chinese enrolment at UK universities began to soar. Of course, there is more to this than simple affordability driven by favourable exchange rates. The middle class in China has expanded rapidly over this period, personal income has also risen and destination countries and institutions have invested millions of dollars in attracting students to their institutions. The United Kingdom is still widely regarded as one of the world’s most prestigious study abroad destinations. And it has become progressively cheaper for Chinese students to study there. In Australia, the number of Chinese students enrolling in their universities’ has increased, but not at the rate experienced in the United States and the United Kingdom. Of course, this may have as much to do with the overall volume of Chinese students in Australia as it has with currency fluctuation. 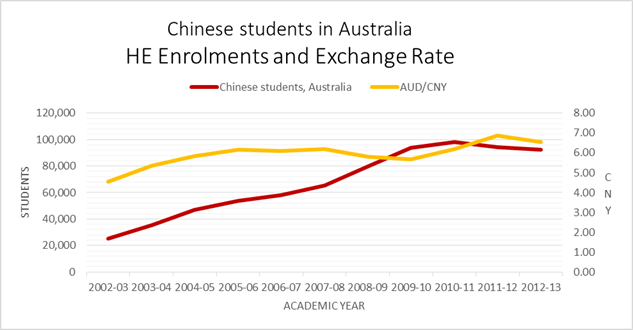 Interestingly as the Australian dollar began to appreciate in value against the Chinese Yuan in 2009 the volume of Chinese students began to decline – a trend which has yet to recover according to the most recent data. India presents a different story. The cost of an overseas education has sky-rocketed for Indian students – especially in the past three years. 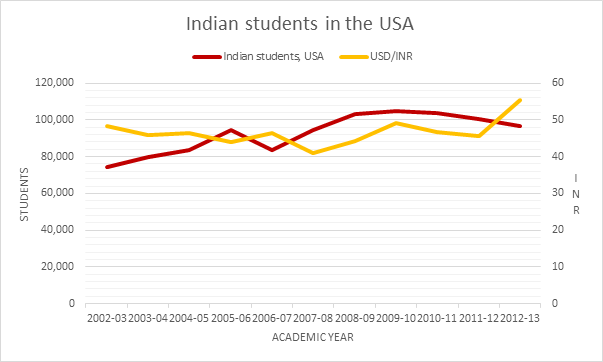 And while this may well have acted as a deterrent to Indian students choosing to study overseas – as can be seen from the overall decline in Indian enrolments in Australia, the United States and the United Kingdom, it does not explain the 54% decline in enrolments in Australia (from 28017 in 2008/09 to 12,265 in 2010/11). Most observers, and indeed the Australian government, accept this was as a result of very negative publicity generated by aggressive visa policy and widely publicised attacks on Indian students in Victoria. 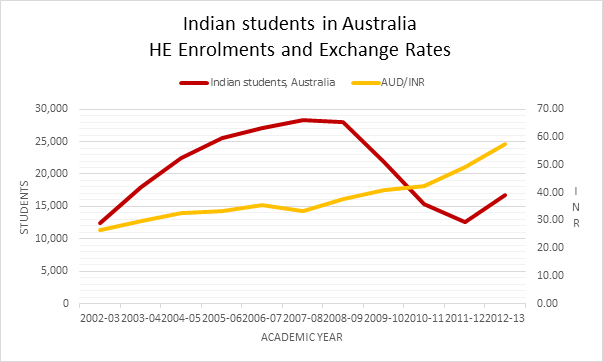 The Knight Review in Australia and the subsequent reform of visa policy, combined with a robust campaign promoting Australia, has seen a rebound in Indian students arriving in Australia for study, despite the unfavourable exchange rate. In particular, the relaxation of the Post Study Work route with graduates from Australian Universities eligible to gain between two and four years’ work experience is reported to have been a major factor in Australia’s recent recovery. 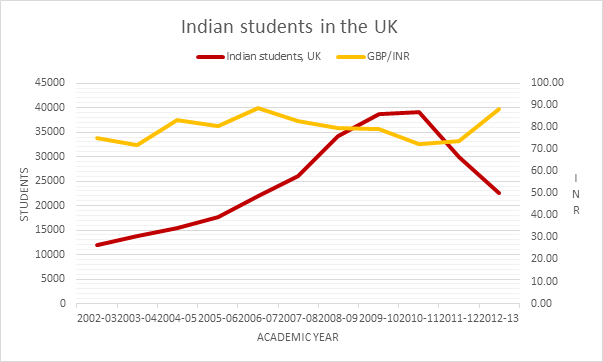 On the other hand, Indian student enrolments in higher education in the United Kingdom have almost halved in the past two years, despite the fact that in the preceding two years, the pound lost value against the rupee. The changes to Post Study Work visas for the United Kingdom and the acres of negative coverage in the Indian media has clearly had an enormous impact. A drop similar to that experienced in Australia from 2009. There appears to be more than a coincidental link between currency exchange fluctuations and future study abroad flows. However, the sudden and very steep decline in Indian students choosing the United Kingdom suggests there is an altogether more complex interplay of issues at work – and that cost combined with perceptions of unfavourable visa policy have a major impact on student enrolments. Students seek value in their overseas study. Our own surveys of international student opinion suggest that for up to 70%, the key motivation for overseas study is to improve longer term career prospects. When costs are reasonable – as is the case for China, then there is no reason to suggest that demand will soften. On the other hand, if students calculate that the trade-off between cost and return is not there, they will vote with their feet. And quickly. Australia witnessed that to its cost in the late part of the last decade and it is only now beginning to show some signs of recovery. Assuming there is a delayed reaction between exchange fluctuation and a drop in enrolments and the negative perceptions of the UK generated by immigration, one fears that the worst is yet to come for UK higher education in South Asia – a tragedy for the sector and for British higher education. Even though there seems to be a drop in migration or enrollment into 4 year colleges, I have notice a trend, meaning international students have been acquiring a 3 to 6 month certification prior to enrolling into a 2 year community college. This trend has been apparent for the last 7 years. Is this trend happening elsewhere ((Canada, Australia, Africa).